Weeks after it announced its use of robot concierge for its malls, SM has gave its SM Megamall shoppers a preview of how these robots will work in a demonstration recently. The robot concierge provides information on deals, promos and events from a touch screen mounted on its chest. It can also reply by voice to basic questions. 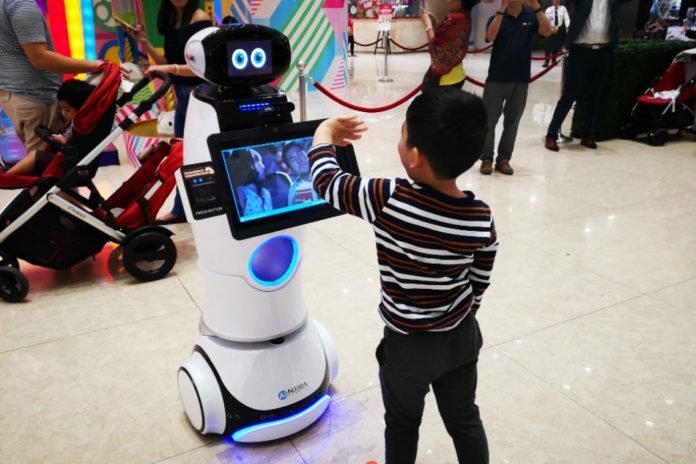 SM Megamall will initially deploy three concierge robots in the first quarter of 2019. If successful, it will be expanded to Mall of Asia, Seaside City Cebu and Aura Premiere, SM Supermalls chief operating officer Steven Tan said. “We believe that technology can aid us in upgrading our service,” Tan said. “The Sy family, the SM group are so much into technology,” said Tan, who got the idea to deploy robots after using one in an airport in South Korea. Taiwan’s New Kinpo Group manufactured the robots for SM. It deploys similar models to malls, banks, convenience stores and airports in the region, said its sales deputy manager Ligo Lim. SM is deploying “a lot of automation,” some of which are not visible, including AI in its customer hotlines, Tan added.